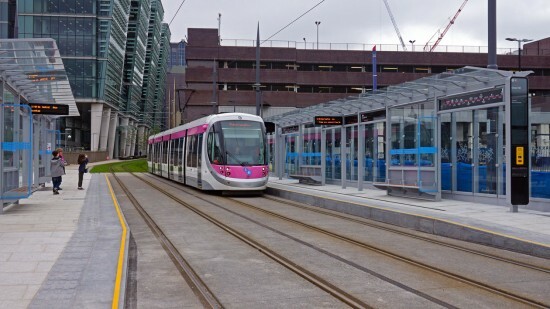 Just two days after passenger services were inaugurated to Grand Central (New Street Station) on Midland Metro’s Birmingham City Centre extension came the opening of another stop with the new stop at Snow Hill welcoming its first passengers on Wednesday 1st June. The stop – which replaces the former terminus inside the railway station – was not quite completed in time for the opening day but with the finishing works now significantly progressed it is now possible to alight at the stop. And that’s where some problems may actually start as access to the railway station directly from the stop isn’t actually available at the moment. 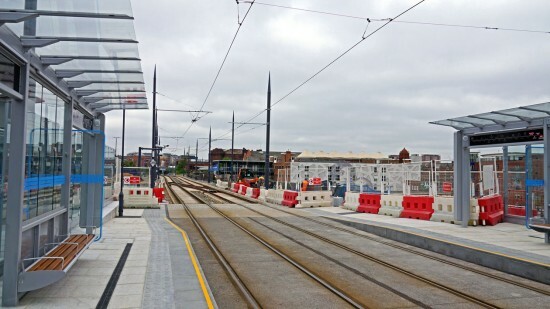 The plan is that passengers will be able to alight from the tram at Snow Hill and access the railway station via the Livery Street entrance but unfortunately construction work to allow this hasn’t been completed yet. 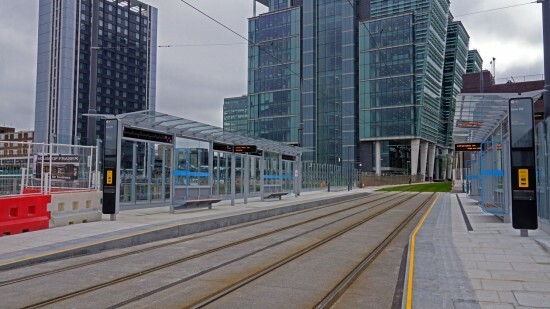 This means that any passenger who decides to get off the tram at Snow Hill has to walk alongside the grassed track towards the city centre and if they want to get to the station they almost have to go as far as Bull Street! In other words if you want Snow Hill station you are probably better off getting off at Bull Street as the walk will be shorter. The first services to call at the new Snow Hill stop did so from the start of service on Wednesday 1st June and from now on all services will stop here. * We will have full coverage from the opening of the full Birmingham City Centre extension on British Trams Online in the next few weeks. 22 calls at Snow Hill on the second day following its opening with an inbound service to Grand Central. A view looking north at Snow Hill showing the construction works still ongoing. A general view of Snow Hill stop looking towards Birmingham City Centre. 26 arrives at Snow Hill with a northbound service. Trams which I photographed on Tuesday 31st May stopped at Snow Hill stop. The doors opened and the trams appeared to be accepting and carrying members of the public, not just driver taining personnel. Was this an unofficial ‘first day’? There was apparently a twitter message announcing it was being served on Tuesday, but I didn’t bother to look for it. Quite a few people (Branch Line Society members going to an evening visit in the area) were on trams that did call at Snow Hill on Tuesday 31 May and I bought a return ticket from Grand Central to Snow Hill and used it on 31st. It seems to be called ‘Snow Hill’ rather than ‘Snow Hill St Chads’ There is a picture in last week’s Branch Line News (electronic version) of trams calling in both directions. 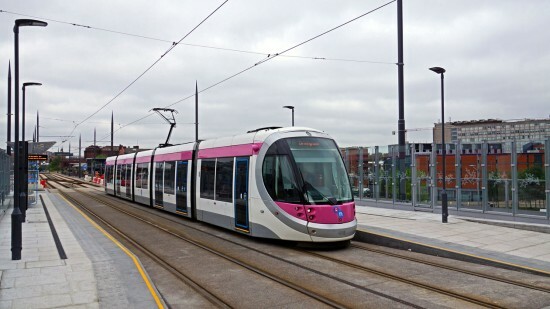 Midland Metro Twitter at 08.36 on Tuesday said that it opened that morning and apologised for the confusion. Tram crew confirmed they did not stop on Monday 30th May (even though the stops were automatically announced and there were passengers on the platforms at Snow Hill). Paul Stewart (Great Malvern). 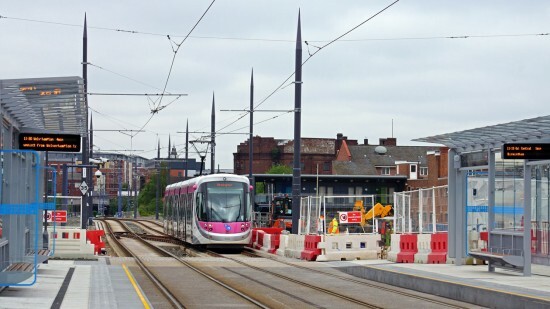 Midland Metro have now confirmed in an email that Snow hill opened on Tuesday 31st May for normal service and no trams called on 30th.